In late 2011 and throughout early 2012, the New York Metropolitan Museum of Art featured one of the most extensive Oriental rug collections in the world, selecting certain pieces from a collection of over 120 carpets and textiles donated by the late Joseph V. McMullan. A collector for over four decades, Mr. McMullan’s affection for Oriental carpets began early in his childhood while growing up in the Bronx, where they were part of his home’s décor. Later in life, he remembered fondly, “I played marbles and hopscotch on them. The pattern was entirely geometrical – easy to set up goals on.” Yet, it wasn’t long before he would revisit and redefine his love for the fine artistry of these rugs. Growing up with numerous interests and abilities, Joseph only received a high school education from Stuyvesant High School in New York before entering the engineering field. His career eventually led him to joining the Naylor Company in Chicago in 1924, where he was put to the task of designing hydraulic dredges. However, after setting himself apart professionally from his peers at Naylor, Joseph was commissioned by the United States Government to design a portable pipeline which could be easily assembled by workers to facilitate the advancement of Allied forces in the North African campaign of World War II. This gave the engineer a great deal of prestige in the engineering profession, and eventually allowed him to serve on the organization’s board upon his retirement. And while he may not have been as wealthy as other fine Oriental rug collectors of his time, it didn’t stop Mr. McMullan from building an extensive collection that once consisted of over 200 pieces. Joseph’s interest in Oriental rugs and textiles peaked in his early 30’s when he attended a sale of Oriental rugs at his sister’s request. Her intention had been to have him assist in selecting an appropriate room-sized rug for their mother’s home in New York, yet it sent the deeply studious McMullan on a journey he would never leave behind. With the study he began on his mother’s behalf, Mr. McMullan embarked on a personal admiration for the intricacy and history of Oriental rugs, and inevitably the beginning of his vast collection. In the end, Joseph V. McMullan began lecturing on the craft and in 1965 even published an extensive catalogue of the pieces he had gathered during his lifetime, which then spanned over 400 years of rug making. 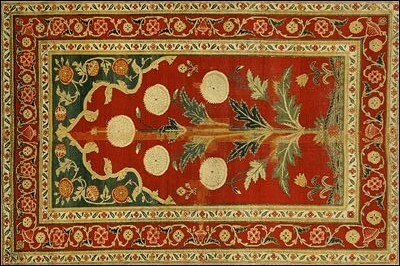 Considered one of the American pioneers in Oriental rug collecting, the Joseph V. McMullan collection is still owned and cared for by the Metropolitan Museum. The collection features splendid carpets of nearly every type, coming from locations between Egypt and Chinese Turkestan, and from periods as wide as the 15th and 19th centuries. A great appreciator of the art and culture surrounding these articles, it was only fitting that after his death in 1973 he should leave his collection to be shown and looked after by those who have unmatched expertise in the area at the museum. And they, too, certainly appreciate his bequest. Do you have a favorite Oriental or Persian rug? If not, be sure to check out our inventory of both antique and modern carpets from around the world. You can also contact one of our specialists who will walk you through the entire process of having your rug appraised. Also, as you may already know, the value of your rug can rise dramatically based on its condition, making it imperative to regularly cleaned or repaired in order to keep it looking its best. If you’d like to see your rug in person, visit our showroom.